Fit to Blog: What about the furries? NEWS FLASH **Looky here**. Power of blogging indeed! As you may know, I live with a number of purry furries, not including The Programmer ;). It's not my fault. It happened accidentally. When we decided to live together he came with two cats and I had one. That's my old cat in the pic above, her name was Jade and she was tabby-nuts, liked to do somersaults. She didn't play well with others so I let her live as an only cat with my Grandparents until she passed of old age last year. So we had two, and for some reason they are not territorial at all. One day a pretty tabby turned up with a broken tail. He didn't leave. He liked our place. I went asking around the neighbourhood and found that he did officially have a home but that his owner didn't want him or love him and was planning to 'get rid of him'. 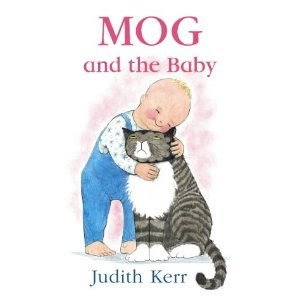 The Niece, Miss J, had by then become attached to him and named him 'Mog' after the cat in this book. Psssh. He got to stay on account of supreme cuteness and tolerance toward toddlers. Then we began to notice a young ginger hanging around the garden and scavenging from our compost pile. I was pretty sure that he had belonged to our neighbours - the ones that had upped sticks and abandoned their rental property. One day he started following me around and meowing incessantly and when I patted him I discovered a collar on him that was literally growing into his neck. Obviously it had been put on him when he was a kitten. Clearly he was homeless. I extracted the collar and, in a show of gratefulness, he proceeded to follow me everywhere, all the time, and still does. Miss J named him JazzyRazzyMaTazzy, but we just call him Razzy. In addition he was an un-neutered tom, and having dealt with that, he turned into a fully domesticated and rather chubby cuddly ginger cat. His job is to heat up the bed at night, listen to my essay drafts and put up with some heavy petting when I'm feeling stressy. After Quake#1 I went for a walk and a little fluffy tortoiseshell cat ran up to me, obviously lost. I left her alone, as per SPCA instructions (don't feed them and they will probably find their way home). I took pics and advertised her all over the place to no avail. A few months later a neighbour came and asked me if I knew who owned her. We agreed that she was obviously a Quake#1 refugee and came to a shared feeding arrangement. I picked her up and she weighed nothing. Lots of fur but just bones underneath. After a few months of shared feeding, The Programmer decided that she 'looks like a 'Miranda''. Welcome, Miranda. Her job is to stop any other cats moving in, she seems pretty good at that. The SPCA Canterbury - they have a pet emergency earthquake fund set up to help care for displaced animals. Many people had to leave their homes and their pets. Pets on the net - actively trying to reunite pets and owners. I also found this heartwarming story on my university website about a team of vets that came from up North just to deal with animal injuries. There is also a lost pets section on Trade Me where lost pet ads run for free. As far as becoming the crazy cat lady, I guess I'll just have to keep an eye on it. I'm sure someone will stage an intervention if the numbers get too high and I start smelling of pee. .. The run donations are still coming in - when I checked this morning, the tally was over $16,000. Most excellent! Now I can go donate to the fuzzy people in addition to the standing up people. :) Ta!